"After studying and working with the Universal Tao books I discovered a different way of approaching life. I was fascinated and intrigued by the books' contents which led me to the Universal Tao workshops and finally meeting Master Mantak Chia. After meeting with Master Mantak Chia I began my internal practice in the Universal Tao System. Over the years I have discovered many techniques which have helped me in my practice in the Universal Tao, and I am here ready to share them with you. First I discovered the Universal Tao System consists of many formulas which have been handed down through the centuries in a teacher-student relationship. The ability of students to master these formulas gives them the opportunity to experience their own self-realization, or enlightenment. Like my fellow students I stumbled for years with these formulas and through my perseverance came to develop, with Master Mantak Chia, formula cards (Chi Cards) to assist me in my practice. Instead of fumbling through the book, as I once did, you can now simply have a Chi Card available to help you complete the formula and proceed much more smoothly in your practice. 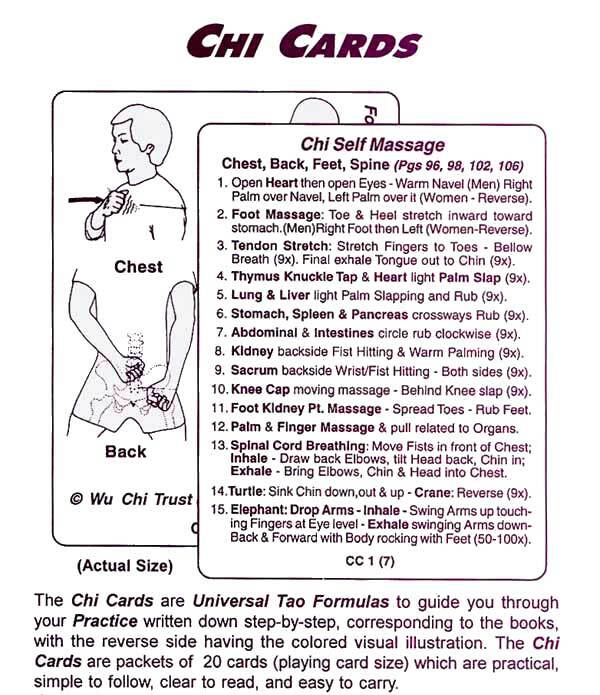 On the first level of the Universal Tao System the Chi Cards consist of thirty (30) formulas based on and corresponding to the seven (7) Universal Tao books: Awaken Healing Light, Transform Stress into Vitality, Chi-Self Massage, Iron Shirt Chi Kung I,Taoist Secrets of Love, and Healing Love. There are 20 cards in a packet available through the Universal Tao for $9.95 per set. The Chi Cards are the size of playing cards which are easy to read and you can easily carry anywhere you go. So you can practice anywhere, just bring your Chi Cards. The front side of the card is the actual formula written down step by step corresponding with the page numbers of each individual book. On the reverse side there are visual color illustrations of the formulas so you can follow them visually. Now available: Level I (30), Level II (30) Level III (50), Level IV (30), Level V (30) , Formulas from Universal Tao Books: Bone Marrow Nei Kung, Fusion I, Tai Chi l; Fusion II, Cosmic Chi Kung, Chi Nei Tsang; Tao Yin, Simple Chi Kung, Cosmic Cleansing, Iron Shirt Chi Kung II, Fusion III, Cosmic Healing, Chi Nei Tsang II, Elixir Chi Kung, Manifestation Meditation, Tai Chi II. This is a very unique and practical way of approaching and working with your practice not only for beginners, but also is an effective teaching aid for certified instructors. You will enjoy using your Chi Cards because they will simplify your understanding and practice of the formulas which allows you to focus on your own essence. In the future the Chi Cards will be available in all levels taught by Universal Tao Instructors. You will be able to start with Inner Smile Chi Card and carry through to the Greatest Kan & Li Chi Cards.